On 3 August 2017 the Australian Pro Bono Centre (Centre) launched Pro Bono Legal Work – A Guide for In-house Corporate Lawyers at an event at the Law Society of New South Wales. This resource is available free of charge on the Centre’s website: https://www.probonocentre.org.au/in-house-guide/. The Guide is central to the joint initiative by the Centre, the Association of Corporate Counsel Australia (ACC) and the Law Society of NSW to increase participation by in-house lawyers in pro bono legal work and to assist corporations to develop policies and see their legal teams integrated with, and contributing to, the corporation’s community engagement program. It is also a prompt to corporations to encourage their panel law firms to undertake pro bono work. He noted that pro bono practice in the private profession has become ubiquitous, a feature of modern practice, and that all lawyers want and expect their employers to provide pro bono opportunities. Brian Salter “deemed” the Guide launched on 3 August 2017. Approximately 80 people attended the launch. In-house counsel representing a considerable number and wide variety of corporations and industries were present, including Westpac, QBE, Macquarie Group Ltd, Insurance Australia Group, and Hewlett Packard Enterprise. Many expressed enthusiasm for pro bono work, and a strong desire to establish robust in-house programs to encourage participation. They discussed the many benefits, including enhancement of professional and personal development of staff involved and the long-term benefits for corporations themselves. Speaking at the launch of the Guide were representatives of the Law Society of NSW, the ACC, the Centre as well as organisations providing pro bono opportunities to in-house corporate lawyers – the Public Interest Advocacy Centre (PIAC), Justice Connect’s Not-For-Profit Law Service and the Arts Law Centre. 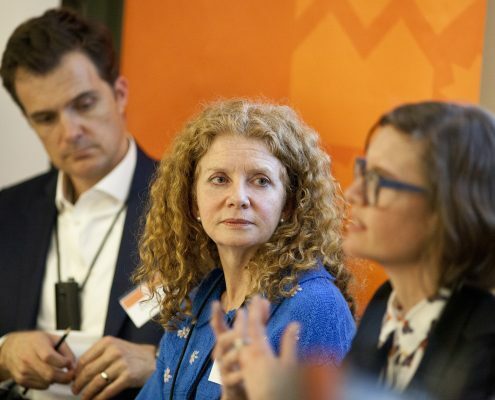 Left to right: Jonathan Hunyor (Public Interest Advocacy Centre), Robyn Ayres (Arts Law Centre) and Rebecca McMahon (NFP Law, Justice Connect) were on a panel at the launch. Photo credit: Chris Gleisner / Law Society of NSW. The Guide is intended to spark greater enthusiasm for pro bono work, and be an excellent resource for corporations wishing to formalise their commitment. It also includes precedent documents to help corporations set up, manage and evaluate their pro bono programs. To support the development of in-house pro bono programs and policies, the Centre has been holding a series of meetings with corporate counsel at a number of large corporations in Australia in recent weeks. Those corporations include BHP Billiton, HPE, NAB, ANZ, APA Group, KPMG, Telstra, Macquarie Bank, Woolworths and QBE. It is hoped that this initiative will result in greater numbers of in-house corporate lawyers becoming involved in pro bono legal work, thereby increasing access to justice for socially disadvantaged and marginalised people in Australia. The Guide can be freely downloaded here. For more information on providing pro bono assistance for in-house lawyers and legal teams, see here. We’ve created a free resource especially for in-house corporate lawyers, to equip you for pro bono legal work. 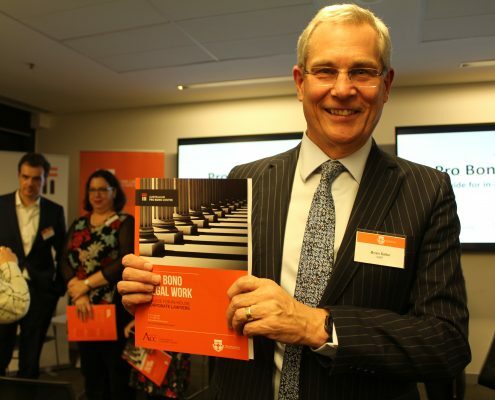 Download Pro Bono Legal Work: A guide for in-house corporate lawyers. Conversations with corporate counsel: Why pro bono?